Jenson Button has a pretty decent life. He drives in Formula One for McLaren, was the F1 champ in 2009, and his girlfriend is Jessica Michibata, a gorgeous model from Japan. 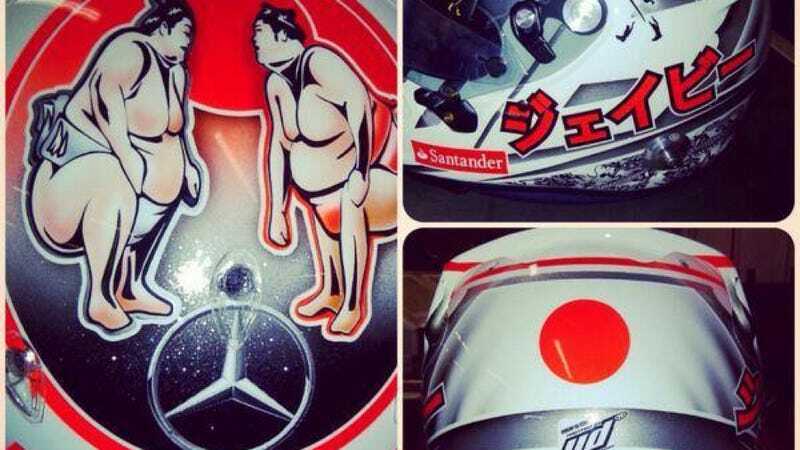 His helmet for the Japanese Grand Prix celebrates her heritage, and it totally rocks. Jenson's normally gung-ho British helmet design changes for the Japanese GP each year, and this time he has some sumo wrestlers up top, a Japanese flag out back, and Japanese characters on the side which apparently phoenetically spell JB, which are his initials. Right now, this is the coolest helmet for the Japanese Grand Prix, unless Sebastian Vettel does something like he did in Monaco, with naked pinup girls and paint that changes based on the heat.